Bouguereau's paintings values in the market place have literally exploded; from paintings selling for and average $500 to $1500 in the 1950’s, to where in the last six years alone his auction records have been broken another 4 times. In 1998 The Hearts Awakening sold for $1,410,000 at Christie’s New York. In 1999 Cupid and Psyche, Enfants sold for $1,760,000 also at Christie’s to be surpassed the very next day at Sotheby’s when Alma Perens owned by Sylvester Stalone sold for $2,650,00. That record only lasted one year until May of 2000, when Charite sold $3,520,000 back at Christie’s. Over the last 20 years Bouguereau's paintings all over the world have been taken out of their crates, basements, storage rooms and attics, dusted off, many cleaned and expertly restored, and today over a hundred museums and institutions proudly have paintings of Bouguereau on permanent exhibit. SPECIAL NOTE : The painter will make the reproduction as close to the original oil painting as possible. 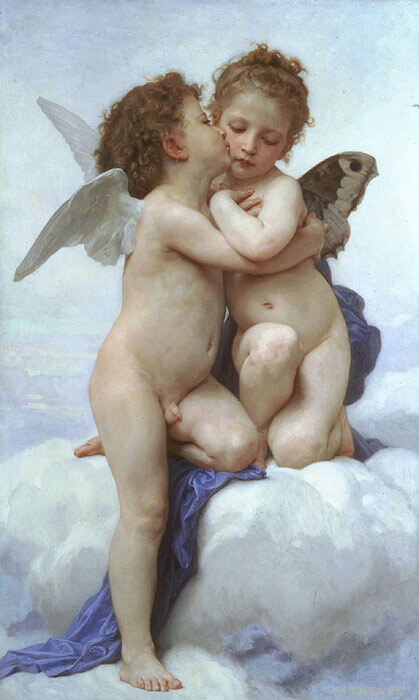 If you want your painting to alter from this likeness, please email us and " L'Amour et Psyche, enfants [Cupid and Psyche as Children], 1889 " will be reproduced according to your special requirements.